Who doesn’t love a roast dinner? We regularly have a Roast Chicken dinner as a treat. And depending on the time of year, may of may not have “all the trimmings”. In the summer I try to add fresh salads instead of stuffing, and new boiled potatoes instead of roasties. 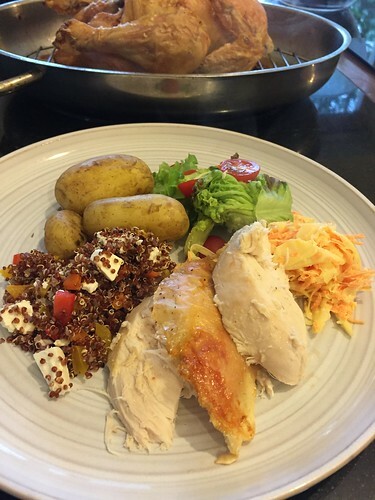 A Roast dinner is like any meal really- you can choose to make it healthier with just a few simple changes. The one thing I don’t like to compromise on is the meat. I’m not a fan of buying leaner meat to reduce the fat. Cook it with the fat on to give it the taste, but you don’t have to eat the fat once it’s cooked- except if it’s pork crackling- then you do. It’s the law. And if you do buy a lean joint. Wrap it in some good quality prosciutto or failing that back bacon, it needs the fat to help the flavour! In this case I’ve taken a free range chicken (organic is just out of my budget unless it’s one of our own- and they aren’t really suitable for roasting.) Sprinkled a little flaky sea salt and some freshly cracked black pepper, and added the slightest drizzle of some super duper special olive oil. Make sure the balance of vegetables on your plate is right. This means in essence- make sure you have more vegetables/ salad on your plate than everything else. And yes, I know we are all trying to be conscious about portion sizes. But in this case- as long as there’s no hidden dressings or gravy over it all- go for broke. Speaking of sauces- they are often a key addition to any Roast dinner. 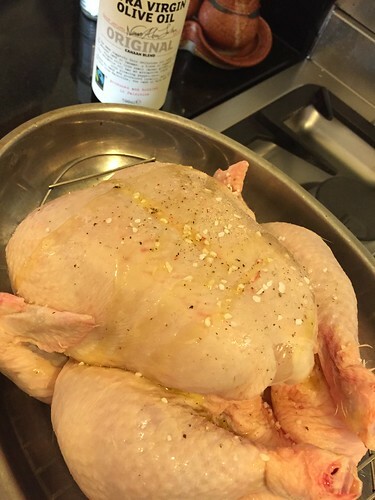 If you really have to have gravy- make it yourself- and be careful of the amount of salt you add. Also it’s ok to have a little gravy, the spuds don’t have to be swimming in it! The same with the salad dressing- make it yourself- or even just sprinkle over some good quality extra virgin olive oil. But in this case we’ve gone with simple. Some homemade coleslaw, my super salad and some boiled new potatoes. Now I’m off to watch the olympics….